A 6-point end is hexagonal in shape—it has six points, or vertices, evenly spaced at 60 degree increments around a circle. A 12-point end is a double-hexagon (sometimes called “double-hex”)—it has 12 points, or vertices, evenly spaced at 30 degree increments around a circle. This geometry will also fit on a 6-point fastener. Your tool will work best when it fits precisely onto the fastener. If your fastener is 12-point, which is somewhat uncommon, then you must use a 12-point tool. For 6-point fasteners, a 6-point tool is your best choice. Matching up the points between the tool and fastener means that you will maximize the surface area of steel in contact, making the tool less likely to slip or fail. This is important when you’re applying a lot of force, especially if the fastener is damaged or rusted. Whether the tool is 6-point or 12-point, it is common for the vertices to have a rounded shape at the tips. This avoids engaging with the fastener at fragile corners by increasing the likelihood of contact on the sides instead. The slight downside of this feature is that there is less surface area of steel in total contact (because the corners aren’t touching). On a non-ratcheting wrench, 12-point box ends benefit from having more positions for engaging the fastener. This can be helpful, especially in situations with limited access. However, the tool is more likely to slip or fail when used on a 6-point fastener, especially if you apply a lot of force. Tekton uses 12-point box ends on its non-ratcheting wrenches. On a ratcheting wrench, there is a lot less benefit to a 12-point box end because the box end can be rotated by hand to an unlimited number of positions. The 12-point box end is more versatile, but better for lighter applications. Most tool companies use 12-point box ends on their ratcheting wrenches, but Tekton uses a 6 point box end for a better fit. Sockets are commonly made in both 6-point and 12-point styles. 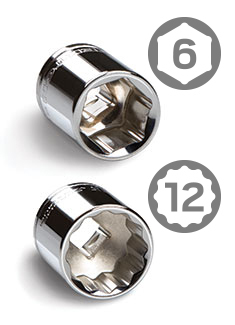 For the best fit, choose a 6-point socket for a 6-point fastener and a 12-point socket for a 12-point fastener. Tekton offers sockets in both varieties.